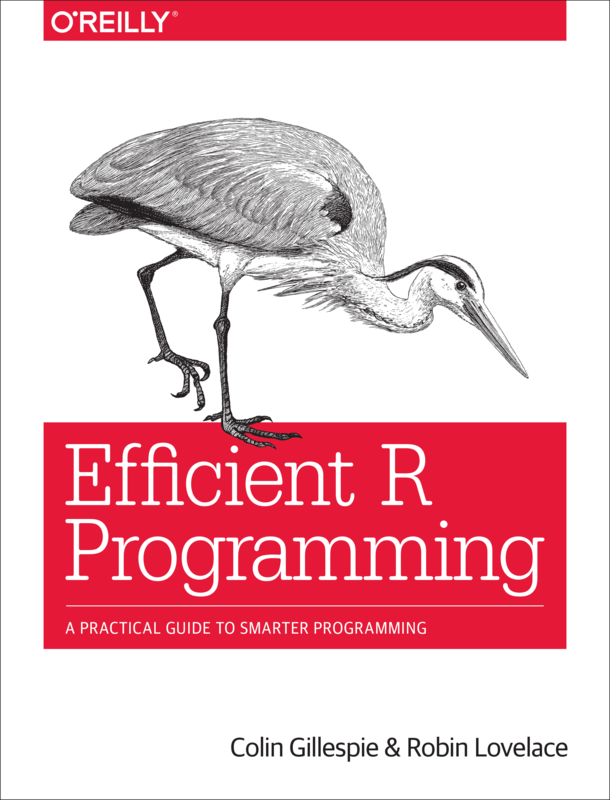 This is the online version of the O’Reilly book: Efficient R programming. Pull requests and general comments are welcome. Colin Gillespie is Senior lecturer (Associate professor) at Newcastle University, UK. His research interests are high performance statistical computing and Bayesian statistics. He is regularly employed as a consultant by Jumping Rivers and has been teaching R since 2005 at a variety of levels, ranging from beginning to advanced programming. Robin Lovelace is a researcher at the Leeds Institute for Transport Studies (ITS) and the Leeds Institute for Data Analytics (LIDA). Robin has many years using R for academic research and has taught numerous R courses at all levels. He has developed a number of popular R resources, including Introduction to Visualising Spatial Data in R and Spatial Microsimulation with R (Lovelace and Dumont 2016). These skills have been applied on a number of projects with real-world applications, including the Propensity to Cycle Tool, a nationally scalable interactive online mapping application, and the stplanr package. Lovelace, Robin, and Morgane Dumont. 2016. Spatial Microsimulation with R. CRC Press. https://www.crcpress.com/Spatial-Microsimulation-with-R/Lovelace-Dumont/9781498711548.